OXO. 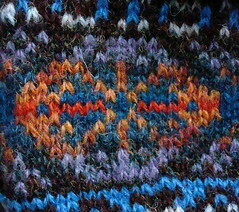 Not Oxo, as in the beef bouillon cubes (although they play a small part in the story), but OXO, as in OXOXOXOXO, a time-honored combination of knitting & letters; as in Ohs & Crosses, a traditional, ubiquitous Fair Isle pattern repeat. The pattern is really a combination of lozenge shapes (Os), joined together with diagonal stripes (Xs)—which is why it’s OXO and not XOX. 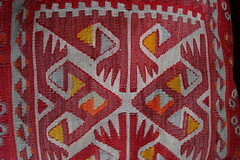 It is really a combination of lozenge shapes with diagonal joining devices, and is common throughout textile traditions. 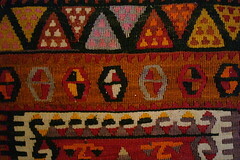 Rug makers, weavers, beaders, all draw liberally upon the lozenge shape. So, too, do designers of parquetry, roof tilers, ceramic painters and many more. 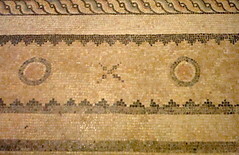 OXO appears in mosaics, too (as in the example from the Zeugma site, now in the Gaziantep Archaeological Museum in Turkey, above. Roman, first to third centuries AD). I’m convinced there are many synergies between mosaic design and knitting, but will try to explore that more fully through a later letter. The OXO motif is found throughout the world for many reasons (as in the Turkish machine-woven fabric at left), but the simplest explanation is its infallible, practical logic. Lozenges with adjoining devices offer a very convenient way to carry out color changes—odd-numbered repeats are easy to remember, easy to improvise upon, easy to calculate. Diagonals shift by one on every new row, expanding or contracting the shape, bringing the diagonals in while widening the lozenges, or vice versa. Color changes can thus occur at convenient intervals so that there is no need for weaving in long floats. Lozenge shapes allow space for simple interior design motifs, such as the flower (or pie!) shape I chose (within the letter “O,” above). Alice Starmore has written more than anyone else I have read on the meaning of the hand-knitted OXO pattern to Shetland Island knitters and its possible sources. She has found an interesting relationship between the variant lozenge shapes found in Shetland knitting and designs for milk churning handles in the Hebrides and northern Scotland. Starmore is adamant, however, that the Xs do not refer in any way to crosses; “Can Fair Isle patterns really be attributed to such religious, mystical or symbolic origins? I think not. Although the Fair Islanders were certainly religious, they were first and foremost a practical people who led difficult lives in harsh conditions.” (Starmore. 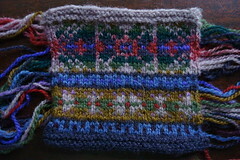 Fair Isle Knitting; 12-13.) I’m not sure how or when religious symbolism became impractical, but I can believe that if it was a factor at one point, it is quite secularized by now. The Greek letter, chi (Χ), after all was for centuries—and still is—the symbol for Christ and Christianity. And yet, the X or cross does appear in plenty of non-Christian patterning. 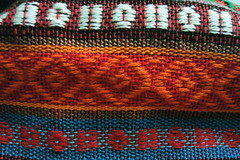 The design, above & right, is a detail from Rona, one of Starmore’s designs from In the Hebrides, and a prime example of a 25-row OXO pattern repeat. 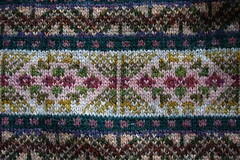 Exactly when Fair Isle knitters began to call this combination of design elements OXO is unclear, but the name dates at least to the early part of the twentieth century. Anne Feitelson explains that British knitters began calling this design element OXO only after the release of OXO cubes in Britain (according to the Oxford English Dictionary, the Liebig Extract of Meat company first used the word Oxo to brand its low-cost meat extract in 1899; concentrated bouillon cubes arrived a few years later). Since Feitelson doesn’t cite a source for the Oxo foods connection, I assume the story stems from local tradition of the Shetland islands. 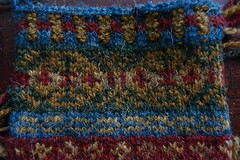 The design at left is a swatch for Alice Starmore’s Roscalie waistcoat. I used this letter to explore OXO and to try out some new color combinations. I’m going for a summer’s evening look: bright, hot colors against a dark, bluish backdrop, but the colors aren’t quite there yet. At this point, it’s just a sketch; just another entry in the abecedarium & book-o-letters. In the past several years, the OXO cable has become popular. It appears to refer more directly to another combination of Xs and Os: XOXO, or hugs & kisses, but it looks great in yarn, too. Ann Feitelson. 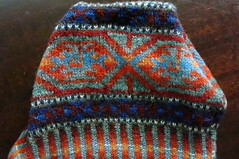 The Art of Fair Isle Knitting: History, Technique, Color & Patterns. Loveland, Colorado: Interweave Press, 1996. Sheila McGregor. 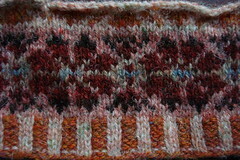 Traditional Fair Isle Knitting. New York : Dover Publications, 2003. Alice Starmore. 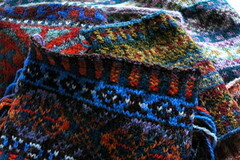 Alice Starmore’s Book of Fair Isle Knitting. Newtown, Conn. : Taunton Press, 1988. OXO Fair Isle, by Madeline Weston. Published in Madeline Weston. The Traditional Sweater Book. Surry Hills, N.S.W. : R.D. Press, 1987.
in Dublin slang: all right or O.K. The makers of OXO Foods brought us the OXO Tower in London. Sam Farber, owner of OXO International, settled on the name OXO because, “whether it’s horizontal, vertical, upside down or backwards, it always reads ‘OXO.’” The company won a Cooper-Hewitt design honor for its swivel peeler this year. Strange, but true: the OXO bedroom set. My gosh, that is an OXO furniture set! Thank you for the trip through OXO knits. Fascinating. As usual, you have given us a fascinating entry and a goldmine of links to follow. Thanks! Beautiful swatches, I love OXOs, my favorite. Delurking here to say I love your info laden posts and your gorgeous color work. How in the world did you come across the Gaziantep museum link? My dad is Turkish and an archeologist to boot.